In 1927, Charles Lindbergh won the Orteig Prize for becoming the first pilot to fly nonstop from New York to Paris. Few know that Lindbergh won $25,000 for the flight, but everybody knows about the revolution that followed. That transatlantic flight opened people’s minds to what was possible in air travel. Investment in the aviation industry exploded, as did the number of people buying plane tickets. Obviously, the impact of the Orteig Prize continues to this day. It provides a perfect example for the seventh and last installment in an expert training series on how to design and operate prize competitions to maximize success. In a Jan. 14 webinar on Post-Prize Industry & Post-Prize Impact, experts explored ways to ensure a competition continues to make an impact long after a prize has been awarded. “You should really think about it all the way through the process,” said Stephanie Wander, associate in prize design at XPRIZE. That work could include a roadshow to talk about solutions, holding team summits and investor showcases, conducting field tests or going on a press blitz to spread the word. It all depends. For instance, are you looking to create a post-prize industry or cure a disease? Case in point: USAID’s Fighting Ebola Grand Challenge. In addition to providing front-line healthcare workers with a safer, easier-to-use suit, the challenge also produced innovations in sensors and information technology. XPRIZE Director of Prize Operations Salima Ranmal joined Wander and Bonnell for a wide ranging discussion that also touched on a variety of budget considerations. Below is a rundown of some of what the experts had to say. You can also watch and listen to the entire webinar. Begin with the end in mind: Desired post-prize impacts should inform the design of your prize competition. What is the problem, and what would the world look like if it were solved? Look at industry challenges and failures. Analyze markets. 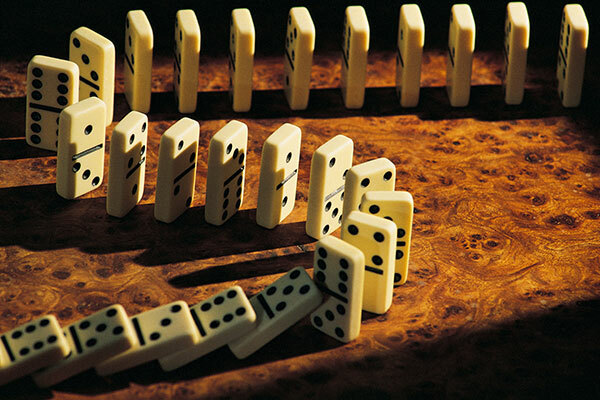 Remember: You’re trying to knock down that first domino that starts a chain reaction. Know what you’re investing in: Is it people? An idea? An organization? Technology? An industry or market? Understanding your investment will guide your activities after a prize. Find the sweet spot: Whether deciding the size of your prize or the scope of your goals, find the sweet spot. Look for something that pushes you, but is not impossible. Get comfortable with failure: A good deal of winning solutions will not work. Recognize, respond and learn from failure. Customize the support you give winners: One team might be business savvy and just needs help reaching investors. Another team might feature scientists with little business acumen. Tailor your support in a way that is meaningful to the teams. Identify and measure your impacts: Are you looking to influence public perception or demonstrate a technological breakthrough, create a market or engage a community? Once you know, you’ll want to find ways to measure the impacts—percent of market growth, number of people affected, amount of money raised by teams, etc. The Expert Training Series: How to Design & Operate Prizes to Maximize Success is a seven-part educational forum on incentivized prize competitions for the federal challenge and prize community. A collaboration between Challenge.gov and DigitalGov University, the webinar series covered various aspects of both prize design and prize operations and featured speakers and best practices from federal agencies.